Universal fitting full traditional awning, side fitting bedroom annexe fits 99% of all standard full traditional awnings. The perfect solution for those who want to add additional storage space or increase the sleeping accommodation of their caravan awning. The universal fitting bedroom annexe is secured with an adjustable strap system in place of your awnings side panel. Simply remove your awnings side panels and secure this annexe in place - adjust the straps to pull the annexe into position and peg it out, simple. Constructed from the highly durable 150D Revtrex Fabric with a hydrostatic head of 3000mm, the annexe is supported using durable, strong steel poles, allowing quick and easy pitching. This universal annexe comes complete with its own bedroom inner tent in a compact package and is attached to the awning using the adjustable strap system which fits your original awning poles, rather than zipping-in. This ensures a snug, weather and watertight fit. Not Compatible with Caravan Porch Awnings. You must be able to unzip and remove the side panel of your traditional full awning to fit this product. 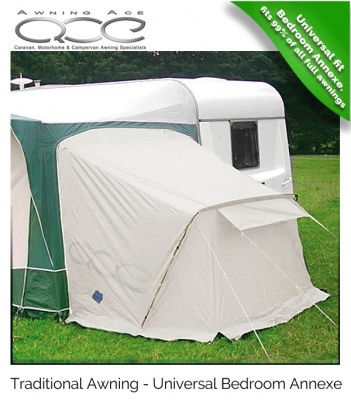 The annexe is attached using adjustable straps and doesn't zip on to your original awning.